As we today mark the International Day of Forests, there is plenty to be concerned about. Deforestation is still advancing at an alarming rate, particularly in parts of Africa and Latin America. Natural forests cannot carry much longer the pressure from growing unsustainable use of timber. But there is also hope: Time may be right for greater private investments in sustainable management of tropical plantation forests. This sense was fully palpable when some 50 global development financiers and business managers met in Finland 13–15 March to see what more private businesses could do to save the forests of Africa, Latin America and Asia. The timing for our meeting could not have been better. Most of the participating financiers had been thinking what to do in the forestry sector, or they have already started to structure new financing mechanisms. All of us acknowledged the urgent need for action. Forest investments are for the long-term and require very patient capital using varying financing instruments at different stages of the investment. But the gains are obvious. The struggle against dangerous climate change will be lost without significant reforestation globally. This was a clear message also from the UN Climate Panel in its recent report on global warming of 1.5 degrees. Trees sequester CO2 as they grow but the climate benefits don’t end with harvesting. Sawn timber and other wood products store carbon during their entire lifecycle. Forests are important also for people and environmental sustainability more broadly. Forests are a source of livelihood, stop land erosion, help improve food security, and help maintain healthy water resources. Beyond that, sustainable forestry can be a good investment financially. Much of Finland’s prosperity is built on sustainable forestry. As development financier, Finnfund has invested one fifth of its global portfolio in sustainable forestry projects and funds in Africa, Asia and Latin America. During our discussions it was recognised that now is the eleventh hour to scale up supply of sustainable wood raw material. Growing population and urbanisation in developing markets, especially in Africa, create pressure for urgent need of sustainable wood products, such as sawn timber and wood-based boards. This requires investments in wood processing operations. 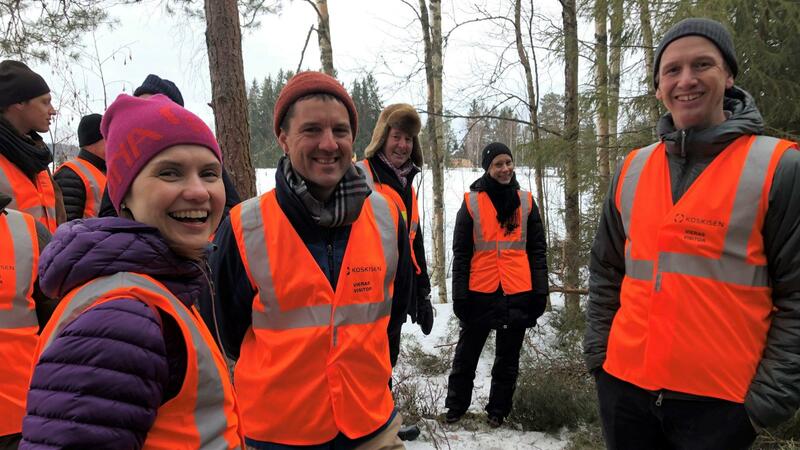 Being in Finland, we took our guests to see some winter harvesting in a snow-covered forest and visited a local saw mill and plywood mill. The local company, Koskisen, sees a great future for wood-based materials, particularly in construction as the negative climate impact of cement productions become more widely known. The meeting was attended by investors and forestry experts from Dutch FMO, IFC, African Development Bank, CDC, IFU, Proparco, Swedfund, BIO, FinDev Canada and Norfund as well as a number of forestry companies and funds from around the world.